IRIDIUM flares are spectacular, bright reflections from satellites in low Earth orbit. Iridium is a US telecommunications company which used a constellation (group) of relatively small satellites to provide a mobile telephone system with handsets which could work anywhere on the Earth's surface. The Iridium Satellite Constellation is a system of 66 active communication satellites and spares around the Earth and should be visible this coming week. Below you can see what to expect! Cue the “Space Invaders” sound effects! We’ve shared previously how astrophotographer Thierry Legault will travel anywhere to get a unique shot. 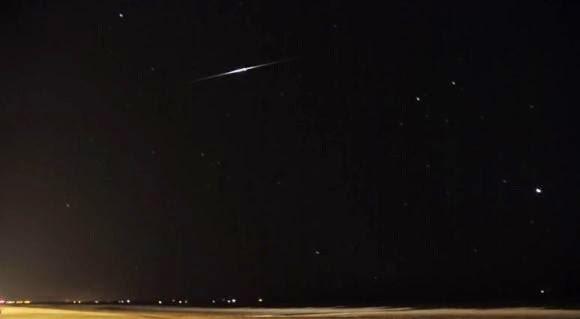 He took this impressive but fun video of an Iridium 72 satellite flaring and passing in front of Jupiter, traveling to Oostende Beach at the North Sea in Belgium to capture this transit. He took both a wide angle view as well as the telescopic close-up view of Jupiter, and from the vantage point of Earth, it appears as though Jupiter gets blasted by the flare. In the zoomed-in view, even Jupiter’s moons are part of the scene. Legault also shared a another recent video he shot of the Chinese Yaogan 6 satellite. “It is probably out of control, quickly tumbling with very bright and short flashes,” Legault said, and it has been tumbling for about a year. Yaogan 6 is a radar reconnaissance satellite launched by China in 2009. Legault said he did the tracking by hand with professional video tripod with a fluid head.